Governments worldwide, major manufacturers, medical facilities, and many of the smartest computer experts around trust their secure communications to PGP (Pretty Good Privacy). But, while PGP works amazingly when all is in order, it isn’t always easy to configure and can be very tricky to troubleshoot. And email security is hardly the sort of thing you want to leave to chance. 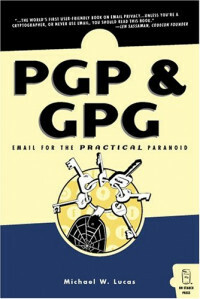 PGP & GPG: Email for the Practical Paranoid is for moderately skilled geeks who are unfamiliar with public-key cryptography but who want to protect their communications on the cheap. Author Michael Lucas offers this easy-to-read, informal tutorial on PGP, so you can dive in right away. If you're not using PGP yet, this book supplies the confidence you need to get started. And if you are, it will show you how to use these tools more easily and effectively. Michael W. Lucas is a network/security engineer with extensive experience working with high-availability systems. He is the author of the critically acclaimed Absolute BSD, Absolute OpenBSD, and Cisco Routers for the Desperate (all No Starch Press).